Press the DECEL/SET button when you reach the desired speed using the accelerator pedal. 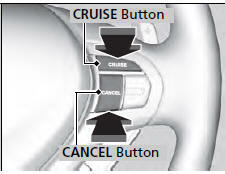 To cancel cruise control, do any of the following: • Press the CANCEL button. After cruise control has been canceled, you can still resume the prior set speed by pressing the RES/ ACCEL button while driving at a speed of at least 25 mph (40 km/h) or more. 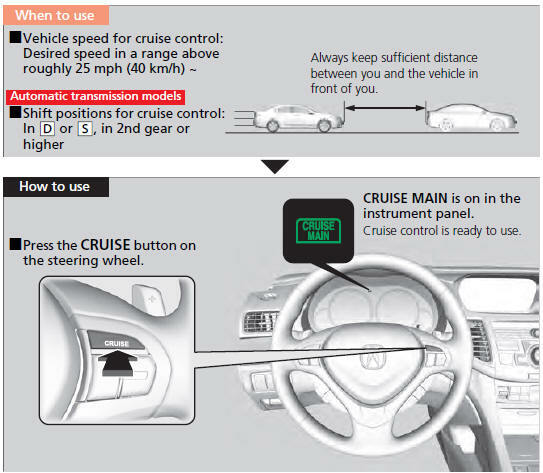 • When the CRUISE button is turned off At vehicle speeds of 22 mph (35 km/h) or less, cruise control is canceled automatically.